Which Service is Best for my Event? When discussing her daughter's party with a client recently, I found that she was having a tough time deciding which services to choose for the event. Do you know which are best for yours? Face paints are actually a water-based makeup, which wash off easily with just soap and water. They can be used on the face or body without issue. I've painted children as young as 4 months, all the way up to really fun grandmas and grandpas. It's the most temporary of the art forms, which is great if parents want their children to have clean faces right away, if they've got school restrictions against body art, or just because everyone loves it! Things to think about are that it does sweat off in extreme heat, rub off on things, and come off in the pool. Most of the temporary tattoos, whether ink or glitter, are alcohol-based and water resistant. 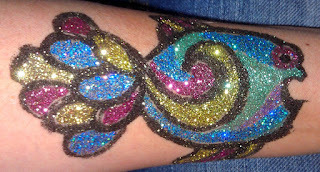 Glitter tattoos are done with a skin-safe medical adhesive and cosmetic glitter; ink tattoos are done with skin-safe temporary tattoo inks. Temporary tattoos don't rub off easily, and last from a few days to a week. More teens and adults are likely to want them too! They're great, therefore, at parties with an older crowd, pool parties, and dressier parties, like Sweet 16s, graduations, and even weddings! These won't come off on the bride's gown, and if she loves hers as much as I did mine, that's a definite plus. The alcohol-based tattoos cannot be done on the face, so they're great for hands, arms, legs, backs, and shoulders. On the other hand, I have an additional adhesive that's safe for use on the face. This one washes off easily with soap and water, so it doesn't have the longevity of the other tattoos. When at an event, I bring both types of adhesive, so they're always available. Teens, adults, and even some kids love henna! It's a traditional art form that goes back thousands of years, and with it, a multitude of designs are possible. Henna is not applied to the face, so it's better at events and during seasons when arms, legs, hands, and even shoulders will be available. When applied, henna is a viscous paste, and can rub and smear if the wearer isn't careful, resulting in a messy stain on the wearer, so it's not recommended for small children who can't keep track of their tattoo until it dries. It's also not recommended for events at which there will be water-based activities, such as pools or sprinklers. A henna tattoo will last for one to three weeks, depending on the skin and area to which it's applied, and cannot be washed, rubbed, or scrubbed off. That's both a benefit and something to consider. Everyone loves balloon twisting, from the youngest child to the most mature adult; they're just irresistible! It's entertaining to watch, and at the end, each guest has received a favor. However, if your guest list is primarily under the age of three, consider that balloon art may not be the way to go. 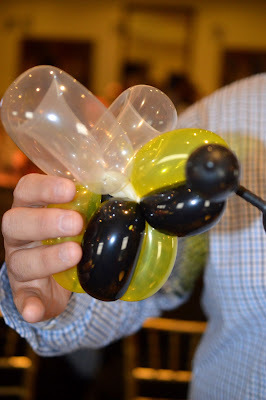 Once a balloon pops, it's a potential choking hazard, and for that reason our artist will hand balloon creations only to the parents of your under-3 guests. While our artist has a menu of balloons he knows well, from which he will work when at a more populated event, if he has time, he's happy to try "winging" new designs, like this adorable bee, which was a first for him. Are all your guests at least 5 years old? Perfect! Our canvas painting parties are different from the ones hosted at those static painting locations. For starters, we come to you! As long as you have table and seating space for everyone, you're all set! I bring my own floor easel, a table easel for each guest, and all of the supplies needed. Also, I don't have a set menu of paintings from which to choose, because I'll paint to any theme with you. 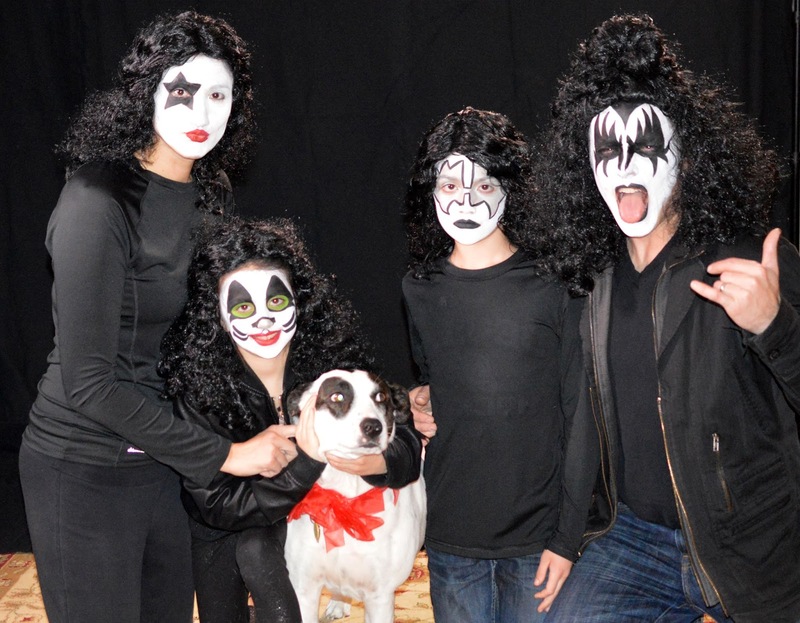 I'll need a couple weeks' lead time to get set up, but in that time, we'll discuss the guest of honor's favorite animal, place, or activity, and jointly design a one-of-a-kind custom a painting to create, geared toward the age group of the participants. I'll teach your guests about color, and about how to see the shapes in things to create paintings on their own too. For an idea of the steps we take, look here.